Jason Duval won his first ever WSOP gold bracelet on Monday night after he won the $1,500 No Limit Hold’em Event. After knocking out the final player, Majid Yahyaei, Duval shouted “Let’s get weird” as he promised a massive celebration. Jason Duval won the $1,500 No Limit Hold’em Event to claim his first WSOP gold bracelet and $521,202. Duval ended Day one of the event with a good chip lead, however, he said that Day 2 was a struggle and he was all in more than once. However, a combination of luck, skill and determination helped him to victory over the field of 2,115 players. 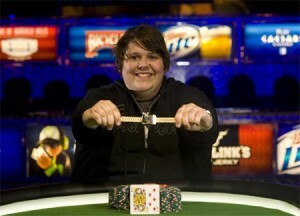 Over the course of the event Duval faced players such as Liv Boeree and 2010 WSOP Main Event Champion Jonathan Duhamel. He said that throughout he was supported by a “tight community” of French Canadian poker players that helped him win, “As you could see on the rail, people were giving me advice. At the beginning of heads-up play Duval and Yahyaei were almost even in chips. However, Duval quickly moved ahead. Eventually Duval defeated Yahyaei to take home the prize money of $521,202. Yahyaei had to settle for the second place prize of $324,442.